There are no crowds in this story. 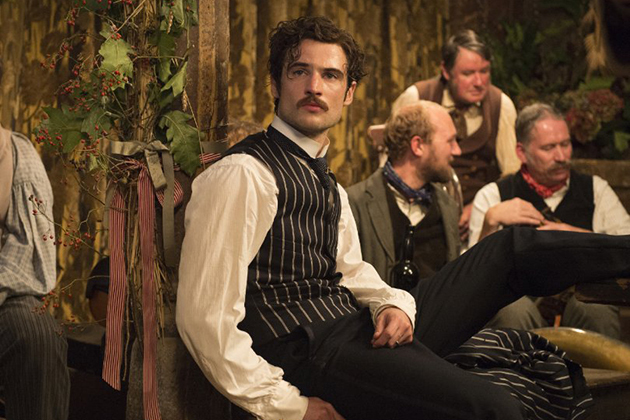 The whole tale takes place far from the so-called “madding” or potentially crazy-making city crowds. The English countryside does hold a special magic. On a recent visit, I discovered the whipping wind and birdsong of those enchanted rolling hills. The title comes from a poem called “Elegy in a Country Churchyard,” by Thomas Gray. It’s a very somber but beautiful dirge of a poem. This film does seem to mirror parts of that poem. The main character Bathsheba, played by camera-loving Carey Mulligan, is potentially written to parallel her biblical namesake as she seeks freedom and independence while unintentionally wooing and winning the hearts of all of the men in her acquaintance. Each of whom, though masterfully acted by Matthias Schoenaerts, Tom Sturridge, and Michael Sheen, are rather stark archetypes written with singular life motivations: to win her affections. The first man is all goodness, loyalty, kindness, and perseverance: the Christlike shepherd. The next is all bad: immoral, cruel, impatient, imprudent, evil: the gambling soldier (the Wickham). The third is the obsessive, quiet, brooding, and disappointed wealthy older neighbor. Perhaps much of classic literature, like this story by Thomas Hardy, is almost like the Greek dramatic tragedies of old. In drama, there were two faces: happy / sad, good / bad. Audiences today seem require more depth of character. They want the “bad guy” to show heart and to be reachable because they know deep down that we all have “bad guy” tendencies within. We need to know that we are redeemable, no matter how bad. And they want the “good guy” to have internal and external conflicts because they want to be able to relate. It’s not enough for us to watch the stories. We want to live them. Perhaps the current prevailing culture trend that craves reality has influenced story in this way. Characters today are rarely one sided. Audiences demand an arc: a beginning, middle, end. Even a comic-based hero flick will allow characterization to evolve over the course of the film. Guy fears water. Guy finally dips a toe in. Guy gets pushed into the deep end. Guy meets swimming soul mate. Guy claims water isn’t so bad after all. …Evolution of character. 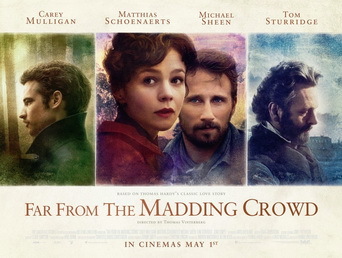 Sadly, “Madding Crowd” offers only immersion, good guy or bad, sadly a single mask for each character. An even more sorrowful story is that the feminist turn in this film also proves less than a win for either side of that pendulum. Bathsheba is offered two pianos and protection but refuses, being a strong-minded and capable independent woman. Then she falls for the unbridled one who offers youthful thrill and sexual awakening. Always chaste and being chased until she caves for the bad boy. Grease lightning on repeat. This film haunts somehow, though. Each beautiful character, though simple, is simultaneously stunning and in no way superficial. Perhaps this story is like an impressionist’s canvas. Up close, it’s simple, harsh, childlike brush strokes. Then, step back and weep at its complexity.